How creative are you in creating something New or valuable to your surroundings? Creativity is one of the Leader's Characters and it has an important role in creating new ideas and giving a value to make a better process, products or even a new way of thinking. Yup, thinking out of the box. It also means to always be ready and well prepared to face all of the obstacles or challenging situations in order to reach our goals. According to Forbes online articles, creative is not only belongs to artists, sculptors, painters or dancers but creative is also for Everyone. 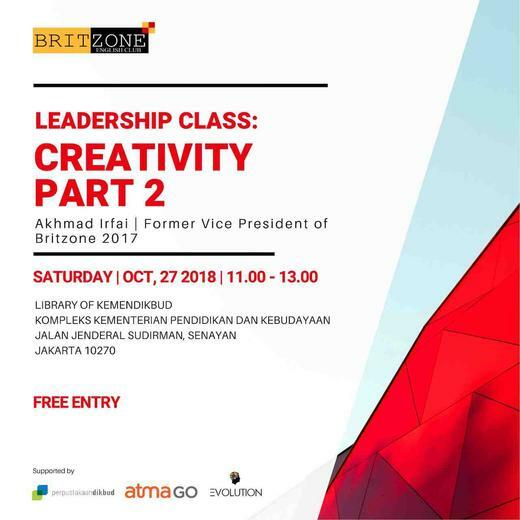 Therefore, to train your creativity skill, don't hesitate and spend your Saturday by joining Britzone Leadership Class Sessions to learn and challenge yourselves to be more creative than you truly are. We are going to have several tasks and challenging activities that you might wouldn't have in anywhere else than here in Britzone Saturday Class. PS: Please come on time, you will never know what will surprise you!